Folding Beach Hammock. Portable Travel Hammock. Available in Standard and XL Models. Please select before checkout. Folding aluminum beach hammock stand is portable, lightweight and indispensable for any beach goers or outdoor enthusiasts. It fits easily into a small carry bag and can be taken anywhere for travel on a boat, airplane or car. It is much more enjoyable to chill out while lazily lying in a hammock than sitting in a traditional beach chair. Single-size hammock fabric is included as a free bonus, but there are variety of other hammock fabrics available on the market that can be custom fitted onto our foldable hammock stand. If hammock fabric too short, you can use provided ropes. If optional hammock fabric too long, you can make knots to make it shorter. Hammock stand made of heavy duty anodized aluminum that breaks into 4 pieces of equal size. XL model of hammock is made of larger diameter aluminum tubes, and therefore can support more weight. Standard hammock model is lighter than XL model. Easy assembly and disassembly with pushpins. Heavy-duty, rust-resistant, anodized aluminum stand frame. Hammock stand weight is 10 lbs for Standard, and 14 lbs for XL model. Distance between hooks is 112" for Standard model, and 132" for XL model. Maximum rated weight is 200 lbs for Standard, and 250 lbs for XL model. Shipping size is 7x7x42", and weight is 14 lbs for Standard model. Shipping size is 9x9x47", and weight is 18 lbs for XL hammock model.. Length of each section is 44" for Standard model. FREE startup single-size hammock fabric with wood spreader included as bonus! 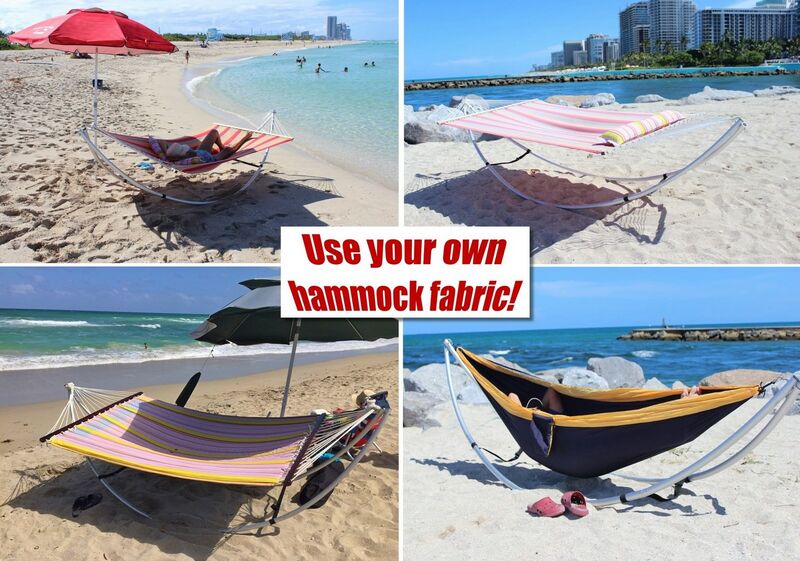 Feel free to upgrade to your own, wider hammock fabrics sold in Wal-Mart, Amazon or Ebay. FREE polyester storage bag with adjustable carrying strap is included! Do not overload hammock. Maximum safe weight is 200 lbs. Do not allow use of hammock by more than 1 person. Do not jump inside the hammock. Please exercise common sense and caution when using this hammock. Please note that folding hammock is not a toy. Do not rock while in it too violently, otherwise hammock stand can overturn and injure its occupant. To minimize risk of injury, please do not rock hammock when placed upon a hard surface, such as pavement, tiles, cement floor or sharp rocks. When assembling and disassembling hammock, please make sure that there is no other people close to you that you may accidently injure with the hammock's frame longer parts. Strong wind can overturn freely standing hammock. Please either rotate it along the wind or place some load inside hammock fabric to avoid it being taken by the wind. Watch your fingers during assembly to avoid being pinched by moving parts. Use WD40 on joint points to make assembly and disassembly easier. Keep joint points clean from sand and debris when possible. If pushpins seems to be stuck and difficult to push on for disassembly, please stand at one end of hammock and shake it up and down few times in order to loosen up the connection between tubes, then hold tube on both sides of joint and try to move up and down to loosen up even more. Then press on pushpin and pull tubes in opposing directions while turning tubes against each other. If provided hammock fabric hanging too low, then simply make a knot on one or both sides of hammocks near the loops in order to shorten hammock fabric length. You can wash sand from hammock parts with salt water at the beach, however we recommend you then flush later on with fresh water to remove salt and reduce the risk of corrosion. To use the hammock for sitting upon as a chair, simply move forward. 6 x 6 x 43"
With the summer coming up, I started looking for a new way to relax at the beach. I looked into foldable beach chairs, but having owned one, they are only comfortable to sit in for an hour or two before they become uncomfortable. There are no real options to be able to stretch out and really relax. This is when I started to look into portable beach hammocks. There are different styles, most are squared off and/or collapsible, but from trying one out, not very comfortable. I did some deep research and came across a style of portable beach hammocks that instead of being squared off and collapsible were able to be assembled piece by piece and was the shape of an orange slice. Yup, orange slice. Completely unique. I had never seen a portable hammock at the beach or anywhere, that could be pieced together and had that crescent moon shape. I looked online to find a supplier for the hammock and check out the prices. I searched long and hard and only came up with a couple different places that carried the hammock. I did some digging and found boatstogo.com. I had never heard of the company so I looked for info on the business. Boatstogo.com had some amazing reviews and some extremely satisfied customers. Not only that, but the same hammock that I was researching was ½ the price of the two other retailers that carried the exact same item.\r\n\r\nI emailed boatstogo.com regarding the availability of the hammock and was pleasantly surprised to get a reply within 45 minutes. 45 minutes, I have tried to correspond with other companies and it has taken hours if not days. Nice work boatstogo.com. Elliot was the contact that replied to me, completely professional, friendly and helpful. I placed an order, hoping the product quality matched the service quality of boatstogo.com.\r\n\r\nOne week later, at my front door was the package from boatstogo.com (I knew the day it was arriving because boatstogo.com supplied me with tracking info immediately when the item shipped). It was packed well, no damage to the hammock, not as much as a scratch. The hammock arrived in its own carrying case that you can sling over your shoulder. It was lighter than\r\nthe usual chair I drag with me to the beach. I brought it with me on vacation and finally had the chance to set it up and give it a run. I took all the parts out and decided to see if I could figure out assembly without looking at the supplied directions. Piece of cake, I had it set up within 10. Strong aluminum shell, 8 pieces that click together, 2 bolts that you use to connect the end aluminum pieces and hang the supplied hammock with and the hammock itself. I sat down in the hammock and yes, I fell out of it (my mistake for setting it up on a hill…). I moved the hammock to flatter ground and sat in it (you can use it as a seat), then stretched out and laid back in it. Holy wow, it was like a little slice of heaven. You can lay back and ties the accompanying rope to a stationary object to rock the hammock or hang your foot over the edge to do the same. It was so relaxing, solidly constructed and well made.\r\n\r\nI have brought it to the beach with me and have already had a half dozen people ask about it and where they can get it, boatstogo.com. I have also bought a second one for my girlfriend, who is in it whenever I am not. Boatstogo.com covered all the bases to make me feel like a appreciated customer. They were fast and accurate with correspondences. They were friendly and professional. They supplied a product that is of the highest quality (and ½ the price of the other supplier). They really know how to take care of their customers and the experience I had prompted me to buy from them again. A phenomenal company and I would recommend you look into boatstogo.com for your boating (or other product) needs. Thank you for making this purchase so easy boatstogo.com!